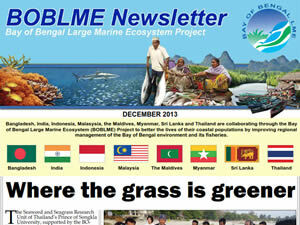 Bangladesh, India, Indonesia, Malaysia, Maldives, Myanmar, Sri Lanka, and Thailand are collaborating through the Bay of Bengal Large Marine Ecosystem (BOBLME) Project to better the lives of their coastal populations by improving regional management of the Bay of Bengal environment and its fisheries. 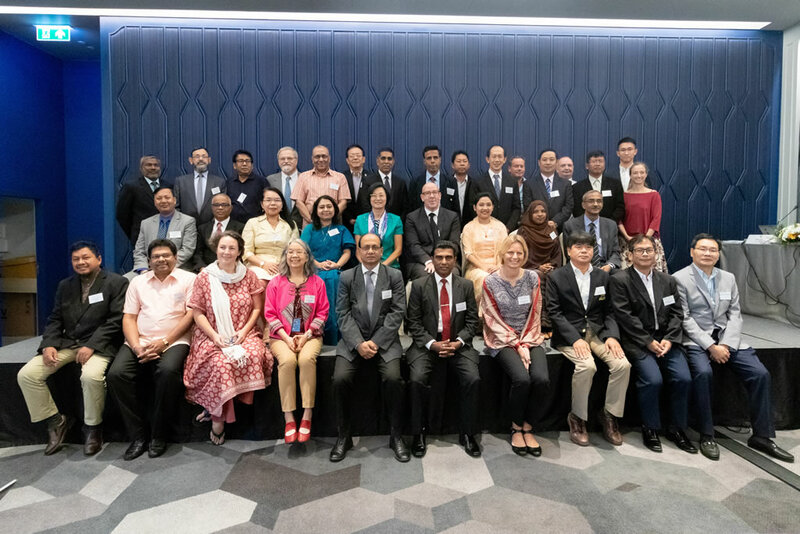 March 2019 - Representatives of BOBLME participating countries and partners gathered in Bangkok, Thailand on 12-13 March 2019 for the inception workshop of the PPG phase. The National Project Coordinator, Project Steering Committee member from Fisheries ministry, and Project Steering Committee member from Environment ministry, all nominated by their respective governments, participated in the workshop. Among the topics discussed during the two-day workshop were: 1) achievements and lessons learned from BOBLME 1; 2) Strategic Action Programme and Project Framework Document; 3) ongoing and programmes/projects in pipeline in tune with the selected BOBLME component areas and specific interventions expected from BOBLME phase 2; (4) experience sharing of India state-level stakeholder consultations ? process and outcomes; (5) sub-regional focus areas for BOBLME from national priorities; (6) process and timeframe for developing the full project document for the FAO child project; (7) roles and responsibilities including project document structure and format; (8) relevant stakeholder groups for national consultations; (9) tentative plan for national stakeholder consultations; and (10) suggested sub-regional and regional coordination mechanisms. 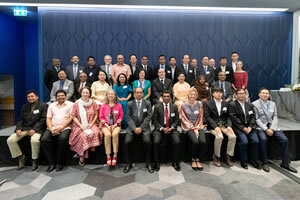 The first regional Project Steering Committee meeting was organized back-to-back with the regional inception workshop on 14 March 2019. FAO and IUCN, International Union for Conservation of Nature and Natural Resources, have partnered through a Letter of Agreement (LoA), to support the development of the FAO full project document for BOBLME Phase 2. Under the LoA, national consultations will be organized and facilitated to identify and validate country priorities under the respective components of BOBLME 2. September 2017 – The BOBLME Strategic Action Program (SAP) has now been endorsed by all 8 partner countries, through the 16 Ministries responsible for fisheries management and environmental conservation. This important milestone was reached after intensive consultation over a period of more than two years. This endorsement now enables the SAP implementation phase to begin. July 2016 – After two no-cost extensions, the BOBLME Project has completed all its in-country activities by December 2015. It is now in the process of obtaining the last (two of 16) outstanding endorsements for the Strategic Action Programme (SAP), while at the same time finalizing the Project Information Form (PIF) for a 2nd phase “SAP Implementation Project”, for submission to the Global Environment Facility (GEF) and implementing partners. For this purpose, a series of consultative meetings has been held in all eight partner countries, and with key partner institutions, during the first half of 2016. December 2015 - Global „Artificial mussel“ (AM) extension in Bangladesh for assessing the risk of trace metal and heavy metal pollutants in fresh, brackish and marine waters: this was the topic of collaborative work by researchers from RMIT University (Australia), City University of Hong Kong and University of Hong Kong (Hong Kong) and University of Chittagong (CU). AM is a cost effective and time integrated monitoring tool developed by Professor Rudolf Wu from Hong Kong in 2007. 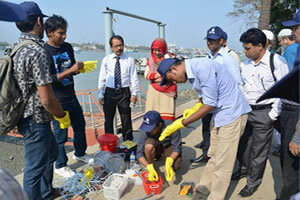 The Institute of Marine Sciences and Fisheries (IMSF), CU was the responsible research institution to conduct the field work along coastal areas of Bangladesh including major water ways of Chittagong, Dhaka and Khulna. This work was carried out from June 2013 to January 2015 with the support of the Bay of Bengal Large Marine Ecosystem Project. The study identified 11 metal pollution “Hot Spots” in rivers, estuaries and coastal waters of Bangladesh on the basis of the concentration of 11 metals (Hg, Cd, Cu, Pb, Zn, Cr, Ni, Mn, Co, Fe & U) from 21 selected sampling sites. The programme was supervised by principal investigators Dr. Md. M. Maruf Hossain (IMSF, CU) and Dr. Golam Kibria (RMIT). This innovative study, which was the first of its kind using AM technology in South and Southeast Asia, sketched out the preliminary information on the present scenario of metal toxicity in the selected sites. Furthermore, two students from IMSF, CU have received scholarships to continue their higher study in ‘The Education University of Hong Kong’ as a part this collaboration. Finally, the study is recommending to generate additional eco-toxicological data for sensitive water bodies for development of national water quality guidelines, ensuring food safety, protection of human health, increasing environmental awareness, and developing capacity through conducting such collaborative studies more regularly to generate time series data and thereby contribute to ecosystem health and sustainable management of the aquatic resources. 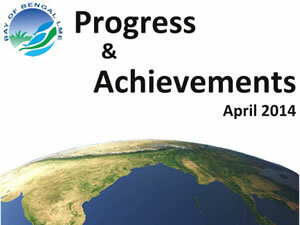 For more information please visit https://www.boblme.org/bangladesh.html. November 2015 - More than 40 representatives of governments, regional and international organisations, fisher-folk organizations, Civil Society Organization (CSOs), NGOs, academia and other relevant actors from Bangladesh, India, Maldives and Sri Lanka assembled in Colombo, Sri Lanka, on 23 – 26 November 2015 for the South Asia FAO-BOBLME Regional Consultation on the Implementation of the Voluntary Guidelines for Securing Sustainable Small-Scale Fisheries in the Context of Food Security. 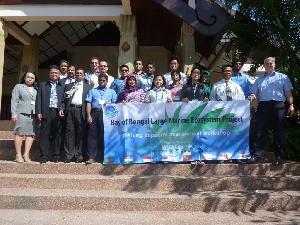 The meeting was organized by the Food and Agriculture Organization of the United Nations and the Bay of Bengal Large Marine Ecosystem Project and co-hosted by the Ministry of Fisheries and Aquatic Resources Development of Sri Lanka; additional financial support was provided by the Government of Norway. During the 3.5 days, participants examined the current status of small-scale fisheries in the region, shared experiences through country and topical presentations and discussions, and proposed actions to support the implementation of the SSF Guidelines at regional and national level. The meeting noted that there are encouraging developments in relation to legal reforms, strengthening participation of small-scale fisheries actors and co-management approaches. On the other hand, many challenges persist, including heavily exploited fishery resources in coastal area, competition from other sectors and insufficient institutionalization of the ecosystem approach to fisheries in national fisheries governance frameworks. Therefore, there is a strong need to move from theory to practice and to link policy and actions in the spirit of the SSF Guidelines. The comprehensiveness of the SSF Guidelines was acknowledged and the need to take a holistic and human rights based approach to small-scale fisheries governance and development was stressed. Efforts should be made to ensure that there is a common understanding on how to apply the human rights based approach in the context of small-scale fisheries. 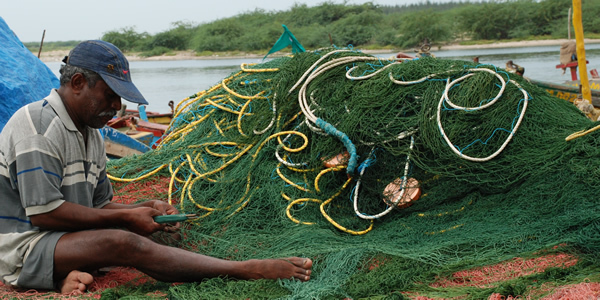 September 2015 - A video film ”India’s disappearing beaches”, produced by the BOBLME implementation partner, the NGO “Pondicherry Citizens Action Network” (PondyCAN, Puducherry, India), as part of the work “Establishment and operation of a Coastal Stewardship Centre to foster Integrated Coastal Management in Pondicherry, India” has been nominated for an award at the CMS Vatavaran - Environment & Wildlife Film Festival and Forum 2015. It will be screened on 10 October between 1.30 pm to 3 pm under the category "Water for Life" (http://vat2015.cmsvatavaran.org/nominations-announced/). The award ceremony is on 11th Oct at 6.30 pm. 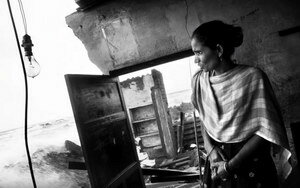 The video highlights the issue of coastal erosion, a particularly serious problem in this part of the south eastern Indian coastline, and the importance of stable beaches for the security of living and working conditions of coastal communities. The film can be seen at https://www.youtube.com/watch?v=KgTn6Qpgjok. The BOBLME-PondyCAN collaboration has resulted in an operational Coastal Stewardship Centre (CSC) with state-of-the-art facilities and resource materials for capacity development and learning in action programs. 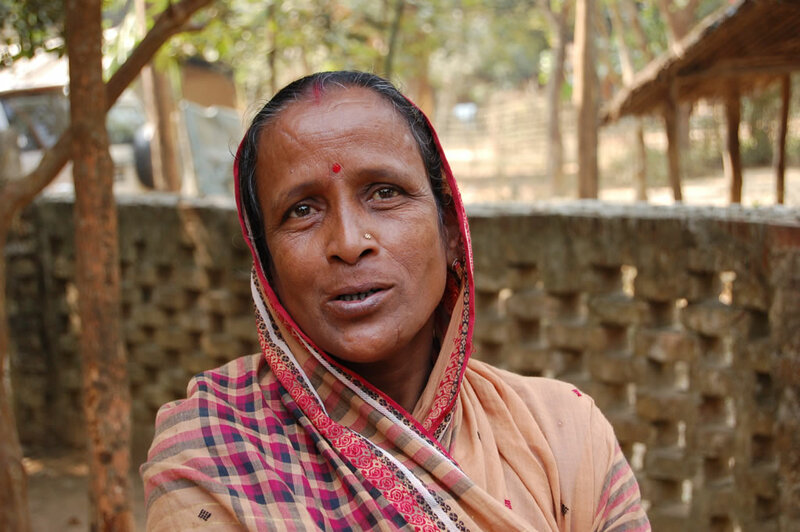 The community-based work covered 25 villages and included a participatory coastal resource mapping exercise and village meetings to validate the maps. 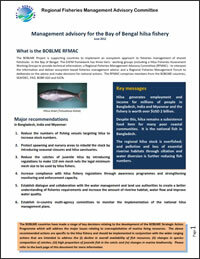 August 2015 – Socio-economic considerations are a major theme of the BOBLME Strategic Action Programme (SAP), and BOBLME therefore provides support to the implementation of the Voluntary Guidelines for Securing Sustainable Small-Scale Fisheries in the Context of Food Security and Poverty Eradication (SSF Guidelines, http://www.fao.org/3/a-i4356e.pdf). 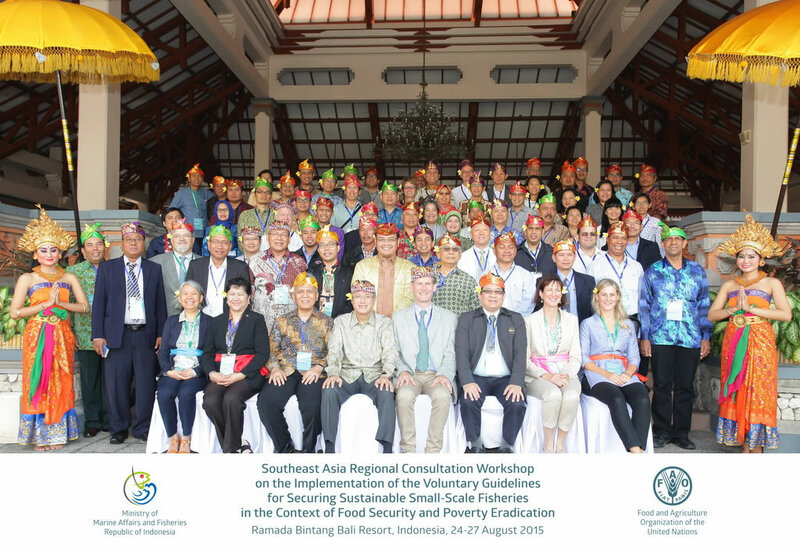 The Southeast Asian Region is taking the lead, and the Indonesian Government, through the Ministry of Marine Affairs and Fisheries, hosted the “South East Asia Regional Consultation Workshop on the implementation of the Voluntary Guidelines for Securing Sustainable Small-Scale Fisheries in the Context of Food Security and Poverty Eradication” in Bali, Indonesia, on 24-27 August 2015. 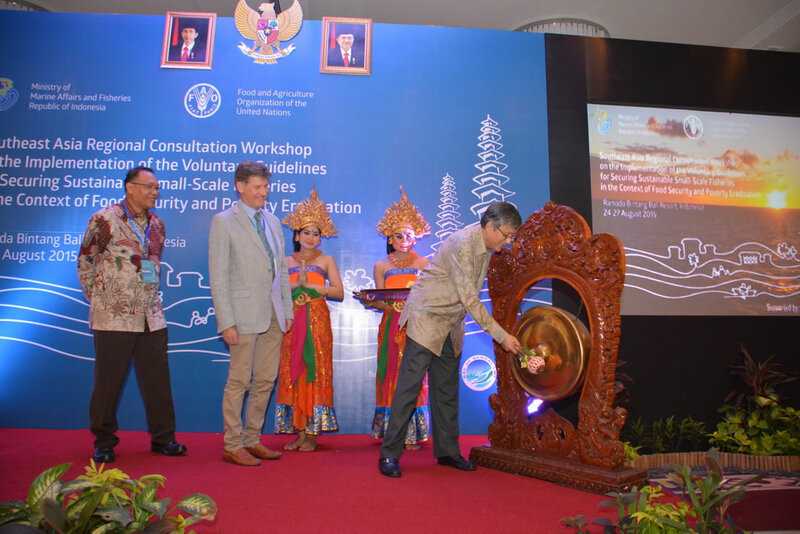 The workshop was co-organized by the Food and Agriculture Organisation of the United Nations (FAO) in collaboration with the Southeast Asian Fisheries Development Center (SEAFDEC) and supported by the BOBLME Project. It was attended by 116 participants including representatives of governments, regional and international organisations, fisher-folk organizations, Civil Society Organization (CSOs), NGOs, academia and other relevant actors. Reduced vulnerability to natural hazards, climate variability and climate change, and increased climate resilience. The Southeast Asia Regional SSF workshop is the first since the adoption of the SSF Guidelines in June 2014 and will be followed by workshops in South Asia and other regions of the world. January 2015 - The issue of excess fishing capacity in world fisheries is an increasing concern. Excessive fishing capacity is a problem also in the Bay of Bengal that contributes substantially to overfishing, the degradation of marine fisheries resources, the decline of food production potential, and significant economic waste. 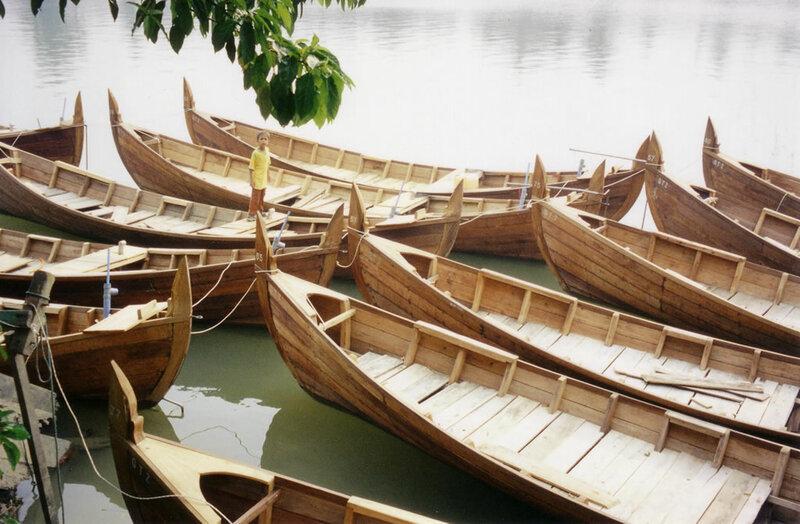 BOBLME countries have requested the Project to provide a training workshop on estimating fishing capacity; this was held in Phuket from 12 to 13 January 2015. 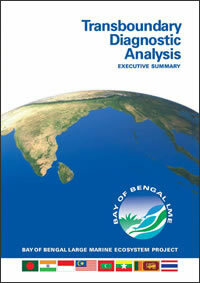 Nineteen government officers from the Bay of Bengal region attended this workshop. The workshop focused on capacity utilisation estimation using Data Envelopment Analysis (DEA) which is a data driven non parametric approach to assess the fishing capacity of fleets. Following a short introductory course on R and R Studio software for statistical computing, and on the Benchmark library which contains the DEA functions, the participants used the country data that they had brought along to make some runs and interpret the results. Although deemed too short, the participants were satisfied with the hands on approach of the training and were able to appreciate the concepts and also the power of the free R software package. They suggested that similar courses be conducted in the future. Visit meeting page. November 2014 - Practicing good science is important, but communicating the results of that science effectively is paramount. 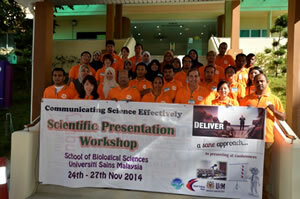 Young scientists from University Sains Malaysia (USM) took part in a training to improve their presentation skills during the four day BOBLME-USM Effective Science Presentation Workshop in Penang. The 22 post graduate students of USM attending the course hailed from Malaysia, Bangladesh and Iran. The course was conducted by CSIRO scientist Dr Peter Rothlisberg and 4 mentors from India, Malaysia and Sri Lanka. The students got an opportunity to acquire skills to optimize their pre prepared PowerPoint presentations of the science work they had been undertaking at post grad level at the university. The course culminated with the students casting their fears aside, taking to the podium and narrating their finely tuned 5 minute presentations with vigor and clarity on interesting topics ranging from tropical oyster production to poultry by products as fish feed. With valuable feedback from their peers and mentors on their presentation performance, the students went home with more confidence in public speaking. The course also included valuable short lectures by Dr Rothlisberg on handling the media, and on using posters effectively. BOBLME has sponsored 7 science presentation courses in the region since 2012. July 2014 - Hilsa is the national fish of Bangladesh, providing sustenance and generating income and employment for millions of people. 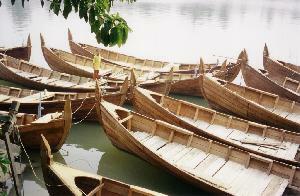 However, hilsa stocks are under pressure from overfishing, pollution and loss of essential habitats. The Bangladesh Fisheries Research Institute (BFRI) in collaboration with the Bay of Bengal Large Marine Ecosystem (BOBLME) Project has produced a video highlighting the importance of hilsa, its lifecycle and the integrated regional management measures being put into place to help ensure its sustainability. 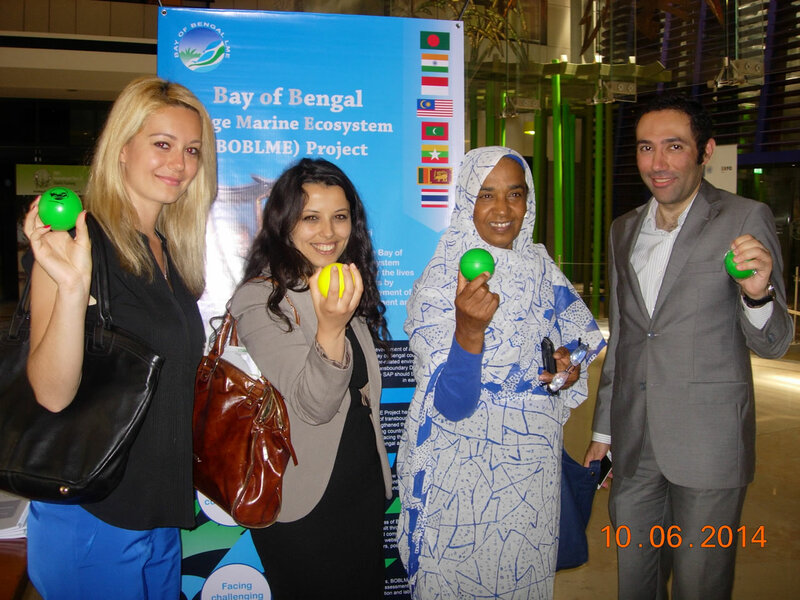 June 2014 - BOBLME project made its presence known at the recent Committee on Fisheries (COFI) meetings held at FAO's Rome headquarters 9-13 June. Recognizing the pressure and worry that comes from trying to effectively manage fisheries, BOBLME handed out its hugely popular stress balls to COFI participants. BOBLME staff also took the opportunity to promote the recently launched Essential EAFM training course to visitors from around the world which when put to use should also help lead to more stress-free and effective fisheries management! 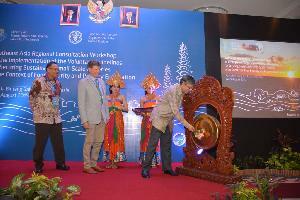 Honolulu, United States and Bangkok, Thailand – 10 June 2014 – A training course which contributes to more practical and effective management of fisheries in Asia and the Pacific was launched today by the Food and Agricultural Organization of the United Nations (FAO) and the U.S. National Oceanic and Atmospheric Administration (NOAA). 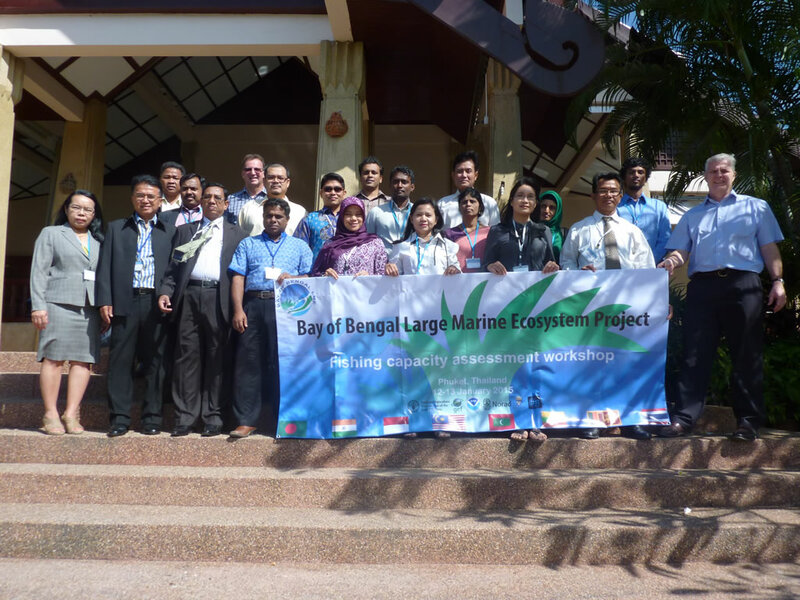 As it enters its final year the BOBLME Project has successfully carried out a wide range of activities as it seeks to facilitate greater regional management of the Bay of Bengal's environment and fisheries. 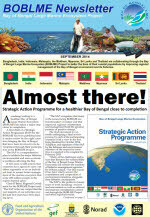 A publication listing all key achievements to date can be downloaded here. 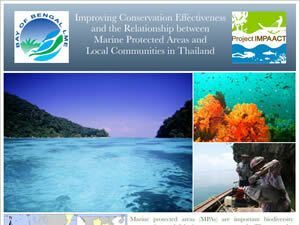 March 2014 - How to gain better local buy-in for national marine parks in Thailand? A policy brief released by Project IMPAACT, which is supported by BOBLME, highlights how negative community perceptions undermine conservation and management processes. The policy brief provides a number of recommendations for improving Marine Protected Area (MPA) effectiveness, governance and management and can be downloaded here. The full research paper on which the policy brief is based ‘Why local people do not support conservation: Community perceptions of marine protected area livelihood impacts, governance and management in Thailand’ can be downloaded here. Download your copy now, here. January 2014 - The capacity of staff from Myanmar universities, government departments and NGOs to better understand the socio-economic circumstances of coastal communities was boosted recently. A BOBLME-initiated, 10-day training course, organized in collaboration with Fauna and Flora International (FFI) and Mawlamyine University saw participants develop 'Socio-economic Monitoring' or 'SocMon' skills. These skills will lead to more informed decision making when applying the Ecosystem Approach to Fisheries Management. For more click here. November 2013 – A scientific survey is underway on the fish resources, marine biodiversity and oceanography of Myanmar waters by the Norwegian research vessel Dr Fridtjof Nansen, operating within the framework of the FAO EAF-Nansen Project and BOBLME. 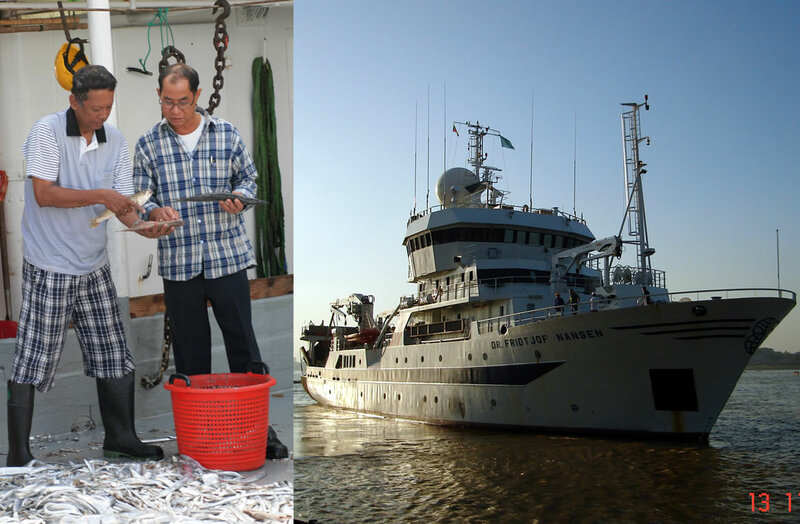 The survey will massively improve the understanding of the status of the marine resources, and provide information essential for informed management and sustainability of Myanmar's marine resources for years to come. For more click here. October 2013 - The Honourable Minister for Fisheries, Shri N G Pannir Selvam from the Government of Puducherry (pictured in the centre) opened the new BOBLME Integrated Coastal Management (ICM) Resource Centre in Puducherry on 4 October. 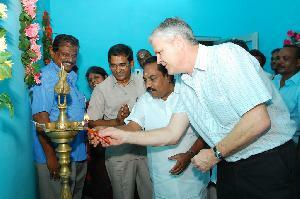 Read more...The opening was attended by about 50 people, including the local fishing community as well as officials from the Department of Fisheries, the BOBLME Regional Coordinator Dr Chris O’Brien (pictured right) and the National Coordinator Dr K Vijayakumaran (pictured left). Dignitaries lit the auspicious lamp before declaring the facility as the knowledge hub for ICM activities in Puducherry. 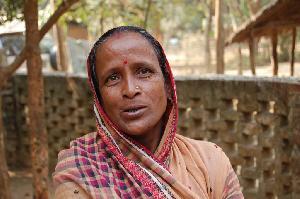 BOBLME-India has been implementing a programme of work on ICM for several years. Led by Dr Vijayakumaran, this initiative is working with the community, administration and stakeholders to promote ICM approaches in Puducherry - a district of just 293 km² located on the east coast of India, just south of Chennai. Puducherry is small in area but is home to over 1.3 million people, so the pressure on coastal resources is considerable. August 2013 — The BOBLME Project Report on Mainstreaming Gender in the BOBLME Project: gender audit and recommended actions for mainstreaming a gender perspective by Dr Cecile Brugere has been featured on the highly influential Genderaquafish website. The BOBLME Project Regional Coordinator, Dr Chris O'Brien, said that this is probably the first gender audit undertaken by any of the 20 or so Large Marine Ecosystem Project's in the world, and it was great to get such recognition from Gender in Aquaculture and Fisheries community. The Genderaquafish website is run by the Gender in Aquaculture and Fisheries community which is devoted to the exchange of information on gender in aquaculture and fisheries from all parts of the world. You can access the website and the report from here. 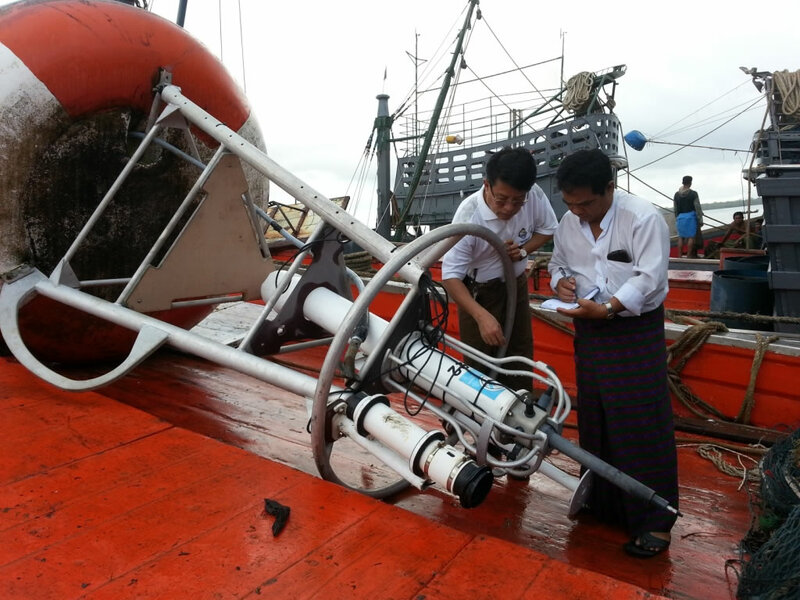 July 2013 — BOBLME Myanmar National Coordinator, Mr Mya Than Tun turned detective recently when an oceanographic data buoy broke its mooring and started an unexpected journey to Myanmar. Following his good work, fisheries officers were able to locate the buoy at the Myeik Fishing Jetty after it had apparently been rescued by a local fishing boat. It is hoped that the wayward unit will be back in service soon. For more click here. 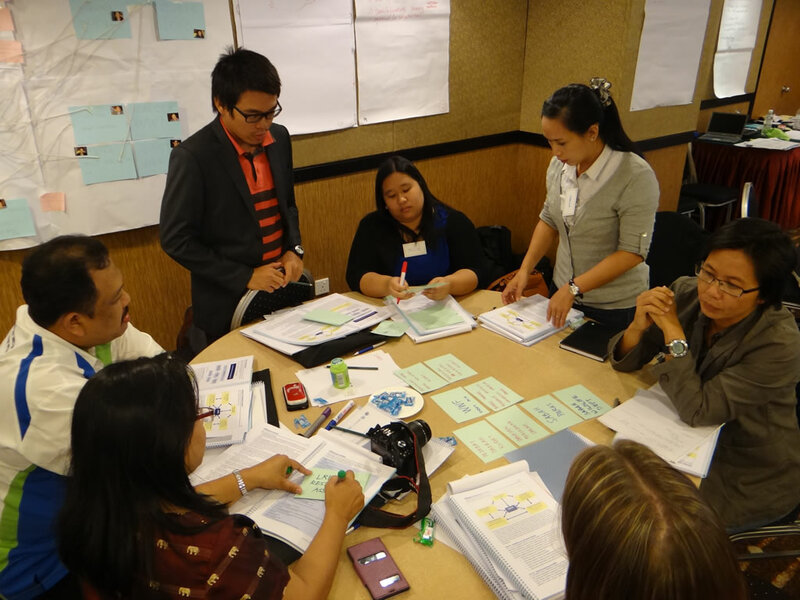 July 2013 – The Ecosystem Approach to Fisheries Management (EAFM) training course developed by BOBLME and its partners enjoyed a successful trial run in Malaysia recently. More than 30 trainees, candidate trainers and EAFM experts took part, testing the training materials in a realistic setting so they could be fine-tuned and finalized. For more click here.